cgdb is a lightweight curses (terminal-based) interface to the GNU Debugger (GDB). 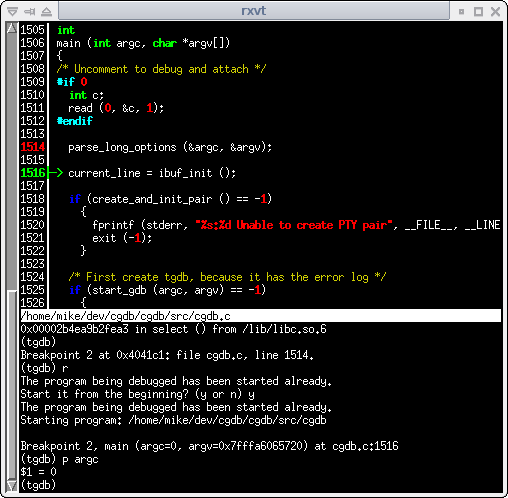 In addition to the standard gdb console, cgdb provides a split screen view that displays the source code as it executes. The keyboard interface is modeled after vim, so vim users should feel at home using cgdb. cgdb depends on libreadline and ncurses development libraries. cgdb: User discussion, Q&A, bug reports, feature requests, etc. cgdb-dev: Developer discussion, patches, etc. Archived discussions are also available in the old Sourceforge project. Or find us on IRC channel #cgdb on freenode.